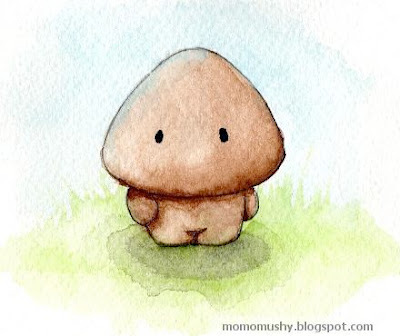 Mushy the mushroom is a character I doodled up when Darcy and I were teaching in Japan. I guess those long train rides to work were good for something in the end. Every now and then I would doodle him in my drawing pad and then eventually I incorporated him with Lily and another character named Abaddon in my Illustrations, and now it's the name of my blog site. So here's the character behind all this madness......ta da....Mushy!! Haha! Oh Hannah. I guess it's because I have a whole house of boys here and it came to me subconsciously.